This Cherry Popovers Recipe is a delicate treat. Cherry popovers are easier than you think and have a delicious buttery taste. Everyone will want more! 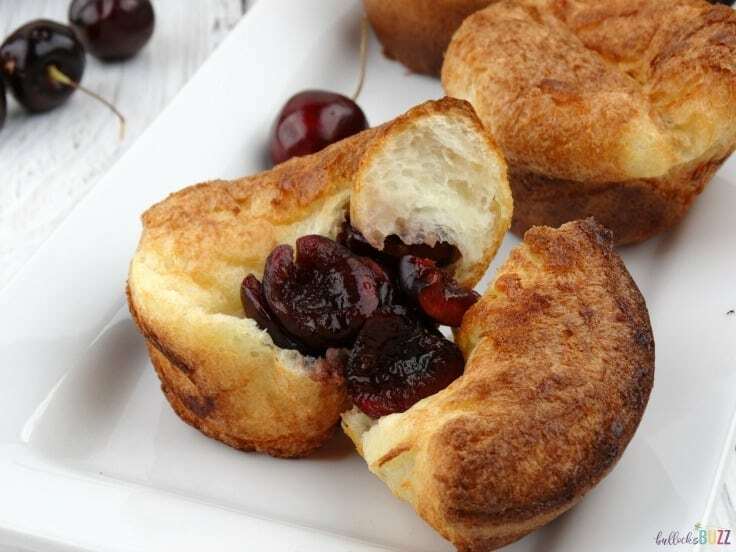 National Cherry Popover Day may have been September 1, but this Cherry Popovers recipe is good enough to make any day! These delicate, almost hollow “rolls” majestically rise up over the tops of the pans they’re baked in, and have a deliciously buttery taste. 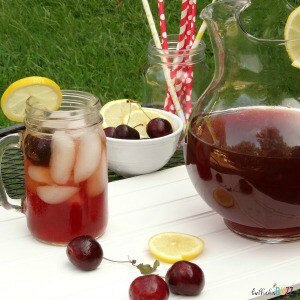 Top them with fresh cherries, and you’ll have everyone asking for more! Hello again, everyone! It’s Alaina from Bullock’s Buzz and I’m back with another simple, yet delicious dessert recipe! These made-from-scratch Cherry Popovers are so easy to make. They don’t require a special pan, nor any special ingredients. Simply mix together flour, milk, eggs, salt, and butter, and in just minutes you have a dozen gorgeous light and fluffy popovers! It’s truly amazing how a few simple, everyday ingredients can make such a delicious and sublime treat! 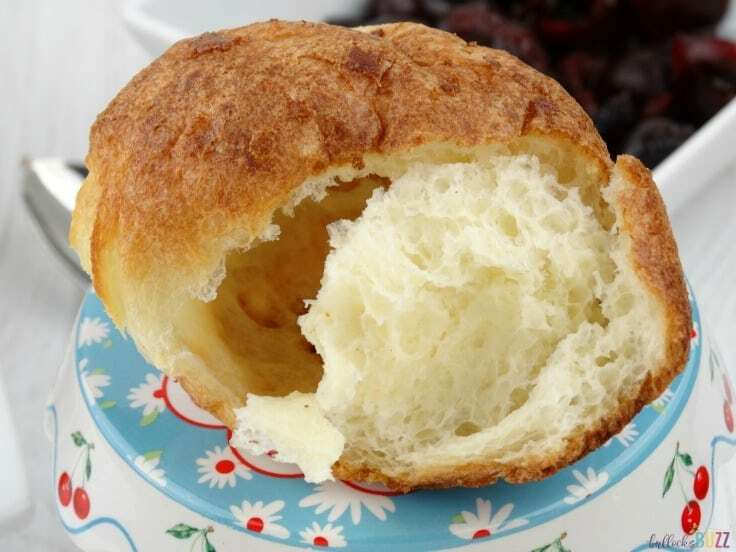 To be completely honest, I’d never made popovers from scratch until I made these. It took me a couple attempts before I figured out a version I really liked. The first batch I made I added the fresh cherries to the batter, but in my opinion, they messed up the light and fluffy texture a popover should have. So for my second attempt, I kept the cherries as a topping instead, and the popovers came out tall, light, airy and absolutely delicious! If you prefer to add the cherries to the batter, I explain how in the instructions below. 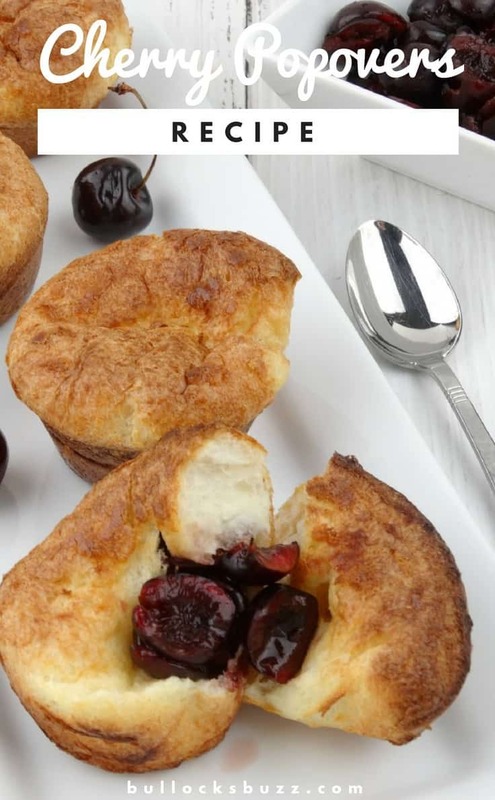 Either way, I truly think you will love this Cherry Popovers recipe! Makes 12 cherry popovers in a muffin pan. The key to light and airy popovers is an extra light touch when mixing and a piping hot oven for baking. So before you do anything, preheat your oven to 450°. Position a rack on a lower shelf as you do not want the tops of the popovers to be too close to the top of the oven, or they will burn. 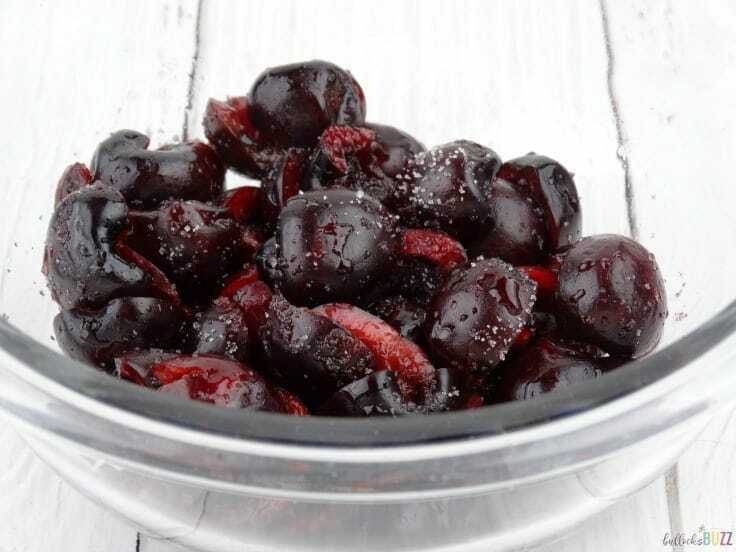 For the cherries: begin by pitting, rinsing, draining and halving the cherries. Place them in a small bowl, and set them off to the side. Begin by cracking the eggs into a mixing bowl, then add in the milk. Whisk well until nice and frothy. Next, slowly add in the flour, followed by the salt. Continue whisking until completely combined. Now add in the melted butter and mix again until the batter is smooth and frothy. If you would like to add the cherries to the batter, go ahead and mix them in now. Cover with a clean towel and let the batter rest for about 30 minutes. In the meantime, pour a half teaspoon of oil into the 12 muffin tin cups (or the popover cups) and use a pastry brush to spread the oil up the sides of each cup. Make sure you cover the area between the cups as well as the cups themselves. Once finished, place the oiled pan into the warming oven. If you chose not to add the cherries to the batter, generously sprinkle them with sugar, making sure to coat all sides. Stir occasionally. By the time the popovers are ready, the sugar will be dissolved and the cherries will be covered in a light syrup. You can also slightly mash them if you’d prefer. When the batter is done resting, carefully remove the hot pan from the oven and quickly pour in the batter. Be sure to fill the cups about 2/3 to 3/4 full. Make sure your oven is at 450°, then place the pan on the lower shelf and bake for 18 to 20 minutes without opening the oven door. Lower the oven temperature to 350°F (again without opening the door) and bake for another 10 to 15 minutes, or until the popovers are a deep, golden brown. It is very important that you do not open the oven while baking or your popovers will deflate. If you notice that the tops of the popovers are beginning to brown too much (after the first 15 to 20 minutes), quickly open the door, position a rack at the very top, and place a cookie sheet on it to block some of the direct heat. Baking times will vary depending on your oven, so turn the light on and keep an eye on them. 6. 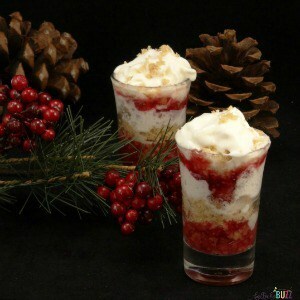 Top with Cherries, Serve and Enjoy! 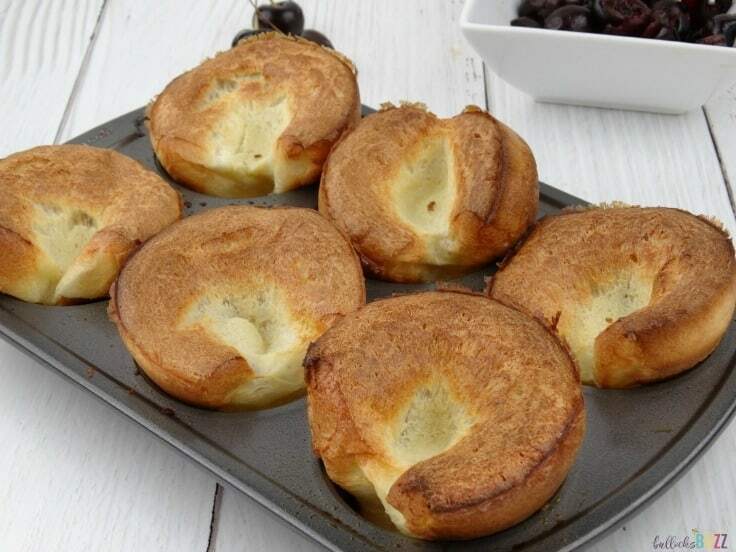 Once finished, remove the popovers from the oven. If you plan on serving them immediately, remove them from the pan, tear open a popover, spoon the cherries inside and enjoy! If you plan on saving some, stick a sharp knife into the top of each popover to release the steam. This will help prevent them from becoming soggy. Tip: dust the warm cherry popovers with powdered sugar for extra sweetness! These Cherry Popovers are the perfect early Fall treat! 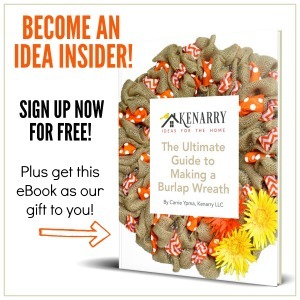 And you just can’t beat how quick and simple they are to make. 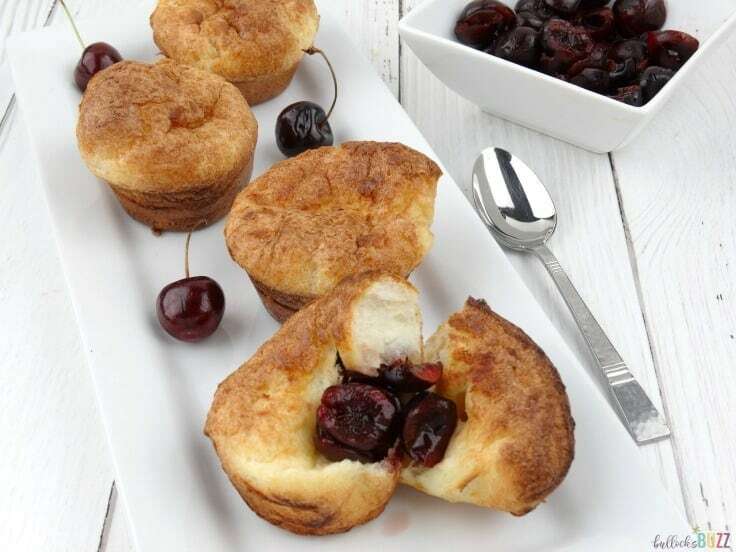 Golden, light and airy, these Cherry Popovers have a deliciously buttery taste; topped with sweetened fresh cherries they'll have everyone asking for more! Begin by pitting, rinsing, draining and halving the cherries. Place them in a small bowl, and set them off to the side. Crack the eggs into a mixing bowl, then add in the milk. Whisk well until nice and frothy. Add in the melted butter and mix again until the batter is smooth and frothy. 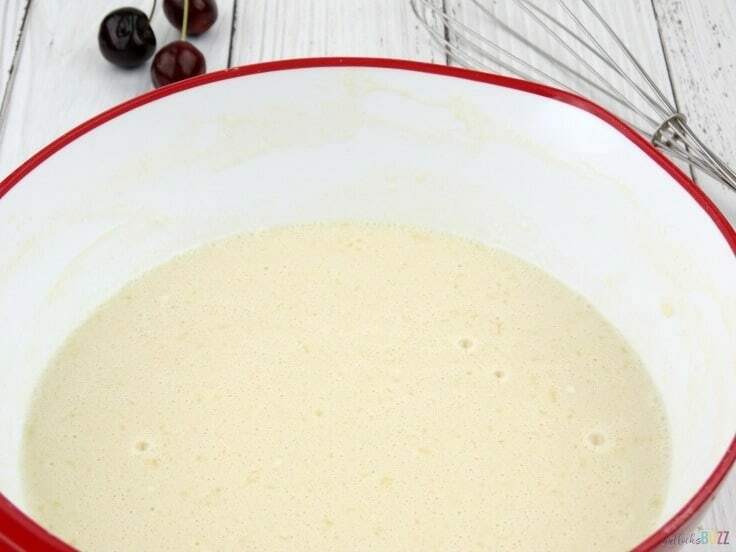 If you would like to add the cherries to the batter, go ahead and mix them in now. In the meantime, generously oil the muffin or popovers pan. Once finished, place the oiled pan into the warming oven. If you chose NOT to add the cherries to the batter: generously sprinkle with sugar, making sure to coat all sides. Stir occasionally. When the batter is done resting, carefully remove the hot pan from the oven and quickly pour in the batter, filling the cups about 2/3 to 3/4 full. Place pan on the lower shelf and bake for 18 to 20 minutes without opening the oven door. If serving immediately: remove them from the pan, tear open a popover, spoon the cherries inside and enjoy! If saving: stick a sharp knife into the top of each popover to release the steam and help prevent them from becoming soggy. Dust the warm cherry popovers with powdered sugar for extra sweetness! Do not open the oven while baking or your popovers will deflate. If the tops of the popovers are beginning to brown too much (after the first 15 to 20 minutes), quickly open the door, position a rack at the very top, and place a cookie sheet on it to block some of the direct heat. 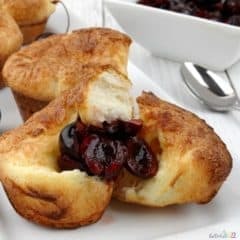 If you like these Cherry Popovers, then I bet you will love my other cherry recipes on Bullock’s Buzz!